Auto-Capitalization and Auto-Correction: Allow iPad to help you avoid mistakes by automatically suggesting corrections to what it perceives as spelling errors, based on a built-in dictionary, or correcting capitalization mistakes you make after you finish entering a sentence. Check Spelling: If you want iPad to automatically check spelling, turning on this feature causes two things to happen: A jagged red line appears under problematic text in apps such as Notes and Mail; and as you type a word with a misspelling, a suggested correct spelling appears in a little bubble. If you also have Auto-Correction turned on, the word is corrected automatically when you finish typing it and add a space or punctuation mark (such as a period) after the word. Note that you can use the Undo key on the onscreen keyboard with numbers displayed to undo automatic changes. Enable Caps Lock: Activates a feature that lets you double-tap the Shift key to activate Caps Lock. Note that when Caps Lock is activated, the Shift key on the onscreen keyboard is blue and you tap the Shift key to turn Caps Lock off. This setting is turned off by default. “.” Shortcut: Turning this on activates a shortcut that allows you to enter a period and a space by double-tapping the spacebar. Keyboards: Gives you access to a choice of built-in keyboards styles such as QWERTY and AZERTY. You can also choose from dozens of language keyboard layout options, including German, Italian, Russian, Spanish, and my personal favorite, Estonian. Split Keyboard: Turns on a feature that allows you to break the onscreen keyboard into two pieces, one on each side of your screen, to make a more texting-like experience for those who like to type mainly with their thumbs. 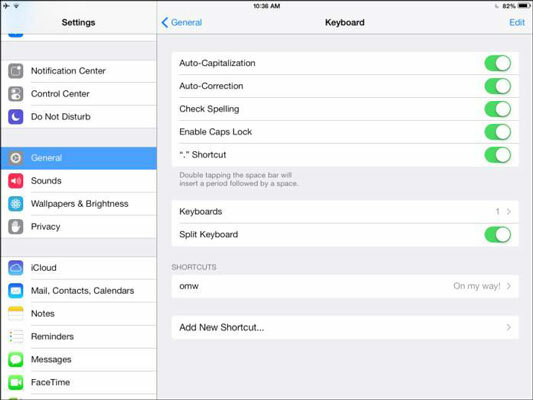 Shortcuts: Use these two settings to have iPad automatically convert common texting phrases into shortcuts — for example, you can replace omw (the shortcut) with “on my way” — or add new shortcuts to its repertoire. Set up your keyboard to work the way you want it to. In addition to modifying Keyboard settings in the General area, you can tap International to access more settings. You can change the language you use for interacting with the iPad; add new keyboards; set the region format (for example, for date, time, and phone numbers); and pick which calendar to use (Gregorian, Japanese, or Buddhist).